Leonardo da Vinci coined the term “attributes of sight”. All such attributes are contrasting, yet are united in nature. Using classical knowledge with impressionistic application and the primary tertiary vibrant colors of Fauvism, the goal will be to create a finished 18″ x 24″ work of art that has both the illusion of depth and the feel of the surface. This course will bring three art movements together into one arena and will be both academic and explosively responsive in its experiential exploration. 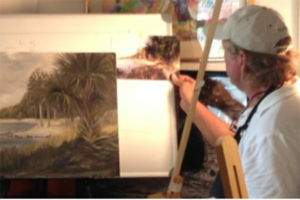 This workshop is for beginner to advanced painters. Please register by July 1st.